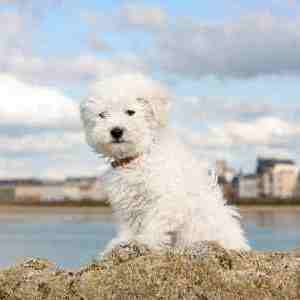 Bichon Frise, Great Family Pet: But, Is the Breed Right For You? The Bichon Frise is a breed of small, energetic dogs, well known for its size as well as its intelligence. These dogs are famous for their ability to entertain, having been taught to perform professionally throughout history. Alongside making for great entertainment, these dogs are ideal companions for families. These dogs love to be near their owners, making for a constant, fluffy companion. However, when they are left by themselves, Bichons tend to get into some trouble. Whether it be chewing on your shoes or going to the bathroom on your carpet, these dogs are known to misbehave when left alone for too long. The breed is not recommended for people who are not home all day, although, some owners will hire dog sitters or send their Bichon to doggy daycare. The Bichon Frise is an energetic breed, but their energy is focused on being playful and social. Like many dogs, however, the Bichon needs regular exercise to help maintain its health and energy. Without something to occupy them, these dogs will entertain themselves with possible disastrous outcomes. These dogs are known for being fairly vocal but they are all bark and no bite, The breed, is not aggressive. They are friendly lively dogs that crave attention. They’ll happily welcome guests that are openly accepted by the owner. Having been used to entertain in the past, a Bichon that has been taught some tricks will gladly perform for the anyone who will stop and watch. These dogs are aware of how small they are and often like to assume the role of a lap dog. They are great for families with with older kids and seniors. Children should always be taught the proper way to handle the dog before playing with them. Very young children may view these dogs as little fluffy toys so kids should be supervised at all times. Some breeders will not sell to families with very young children because of the tiny size of the puppy. 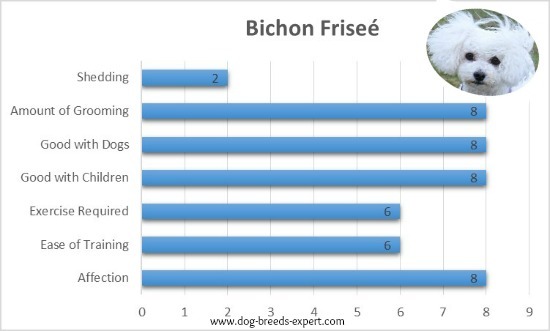 The Bichon Frisé is known for being a somewhat sensitive breed. They won’t appreciate stern reproaches for bad behavior. At the same time, it’s important that they are not pampered either. If they receive too much special treatment, they’ll begin to expect it. While they are sensitive to verbal communication, they are fairly hardy when it comes to nature. These dogs tend to handle both heat and cold pretty well, although, they should not be left in either for prolonged periods of time. Alongside kids, the Bichon is great for families with other pets as well. Their small size keeps them from posing a massive threat to animals much smaller than them. In regards to interacting with other animals, they are gentle and playful. They’ll especially love other dogs. Some may chase smaller pets, so caution is advised when a family also keeps small pocket pets such as hamsters or gerbils. These dogs do fine in urban, surburban and rural settings. They make a good choice for those living in an apartment. Their tendency to bark, may be a problem, so early training and socialization to curb this tendency is important if they are to do well in an urban setting. Likely a descendant of the larger French Barbet, the Bichon Frise originated more towards the Mediterranean sea. Some historians believe that the breed may have come from Italy, although, it seemingly made its first appearance in France in the 14th century. These dogs were probably taken from Italy by the French as tokens of war. It was there that they became a popular breed. 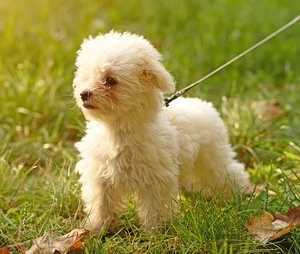 Their name meaning “fluffy white dog” in French, the breed became popular among the royalty in France. They were especially admired for being such intelligent dogs, as well as having such soft coats. Not only in France but in England and Spain did the Bichon Frise become a well-known breed. They remained pets belonging mostly to aristocracy for a long time before becoming a more common dog. The Bichon Frise remained unknown to the world until World War I. After the conflict, the breed became the focus of some breeders in its native country of France. These breeders began to classify and further breed these Bichons, setting up the gene pool for the ones we see today. They would soon see their existence threatened by WW2. WW2 had a large impact on many breeds. The war years consumed Europe with fighting that took place in many urban areas, putting a large number of dogs at risk. Despite the physical dangers of the war, the more perilous economic situation prevented people from owning pets in general. Many breeds saw their numbers drop during these years, some nearly going extinct. After the war, these breeds would proceed to rebuild their populations. The post-WW2 economy in the U.S. was still feeling the industrial boom of the war. As there was more money to go around, people in the U.S. could afford a higher standard of living. Breeds that had made their way into the western hemisphere found themselves enjoying more attention than in Europe. The idea of the family dog grew alongside the conspicuous consumerism of the time. The Bichon Frise made its U.S. debut in 1955, and it soon became a popular dog. Up into the 2000s, the Bichon Frise had grown in its popularity. Having had rebuilt its decreased population from the war, the breed now has high numbers in the US as well as Europe. Today, the dogs are still primarily companions but also participate in obedience and agility. They make excellent therapy dogs as well. Since their registration by the AKC in 1972, they now hold the rank as 45th most popular dog in the US. The Bichon Frise is an intelligent, tiny dog, known for being easy to train. At the same time, they are also relatively sensitive but do well with a consistent, positive, fun approach to training. They need to believe their owner means well and disciplines them justifiably. Close bonds with their favorite person will make training much easier. Housebreaking can be difficult as the small size implies a small bladder as well. Many owners recommend crate training for this breed. As with most dogs, consistent positive reinforcement is the recommended route for training. Scolding a dog harshly for doing something wrong will only make it more reluctant to learn. These dogs are known to pick up commands with ease once their trust is gained. Many owners will take their Bichons to obedience classes to help command their attention. Socialization is an important part of training any dog. An unsocialized dog will be anxious around strangers and anything unusual. They also tend to be fairly vocal about these abnormalities as well. Owners can help socialize their dogs by taking them to obedience classes, doggy day cares, and on frequent walks. This socialization will make them more comfortable in their own environment. 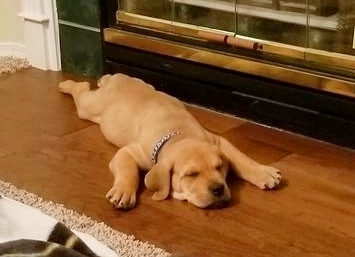 There are no markings for this breed. The Bichon Frise is known for being difficult to groom. While their small size means that there is less to groom, the texture and type of coat mean that grooming must take place daily. They have a fluffy, silky coat that curls similar to that of a poodle. Their soft, curly coat does not shed in the same way as other breeds, which makes them an ideal choice for anyone with allergies. Like all long haired breeds, what you might save in vacuum bags you are going to spend at the groomers and in daily brushing and combing to prevent mats from occurring. It is a myth that some dogs do not shed. All dogs shed, but not all dogs shed hair that ends up on furniture and rugs. 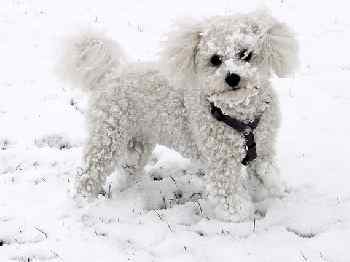 In the case of Bichons, their dead hair is lost into their coat which creates mats or tangles. Always mist the hair with a good conditioning detangler before attempting to brush or comb. At the very least, new owners should expect to purchase some grooming supplies such as a slicker brush, metal comb, pin brush, and small scissors, even if you plan to have your Bichon groomed professionally. These are one of the highest maintenance dogs for grooming. Frequent bathing is vital. Some owners will bathe weekly. Always brush the hair completely before a bath as any mats that might be in the coat before the bath are likely to be even harder to remove afterward. Their white hair also means that they may be more liable to develop face stains or tear stains under their eyes. If they lick their paws or other parts of the body, those areas are likely to get stained too. Professional grooming should be done about every other month if the dog is not being shown. A Bichon Frise is going to need its nails clipped regularly as well. Whenever a dog’s nails become too long, they become uncomfortable, and may dig into the dog’s skin. To prevent this discomfort, owners will typically clip their dog’s nails every 3 weeks. One way to tell if a dog’s nails are too long is if their nails can be heard clicking against the ground as they move. Many owners forget that dogs need their teeth brushed as well. Providing a dog with the proper dental care is just as important as the regular vet appointment. Brushing a Bichon's teeth regularly keeps their breath fresh and prevents tartar and plaque buildup. It’s recommended that they have their teeth cleaned at least 2 or 3 times a week. Many dogs are at risk of ear infections because their ears are covered, not getting enough airflow. 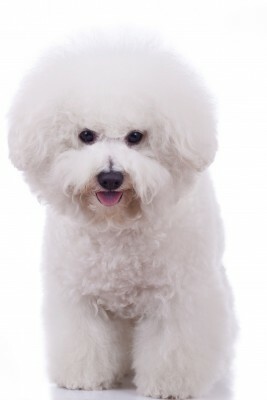 The Bichon Frise is no exception, so they need their ears cleaned and checked regularly. It’s recommended that a dog has its ears cleaned at least once a week. Regular cleaning will remove excess wax and built up bacteria. As you can probably imagine, the idea of a Bichon working as a guard dog is almost comical. Their size makes them pretty incapable of protecting their owner, being so small. They’re better off protecting the property from squirrels than anything else. Aside from them being physically incapable, these dogs are not very aggressive either. The Bichon Frise is a social breed, not one suitable for defending a yard. A well socialized Bichon will prefer to run up and greet a stranger. This being said, they will remain wary of them if they sense danger. If anything, the breed is capable of alerting their owner to an intruder’s presence. Since they are fairly vocal dogs, they will bark at most things that pass by. They do, however, excel in being a watchdog. Dogs, like people, get sick. Unfortunately, they don't have some sort of universal healthcare system. If you are planning on getting a dog, you have to be capable of providing it with full medical care. It is also important to purchase a purebred dog from a reputable breeder. Relatively popular dogs, such as the Bichon Frise, are especially at risk of poor breeding practices. A good breeder will know a lot about the breed, as well as be able to provide health checks for their dogs. Is the Bichon Right for You? Yes, if you want a playful, intelligent, energetic companion. Yes, if you don't want to spend too much time training; they are easier than most. Yes, if you need a dog for a smaller space such as an apartment. Yes, if you want a breed that will live a long life. Yes, if you are a family with older children. No, if you hate to groom dogs. No, if you work long hours or need to be separated for long periods of time. No, if you have toddlers or small children at home. We recommend the books below to find out more about this breed - click on the images for further details! Running with your dog is an excellent way to get your exercise in and bond with your dog. 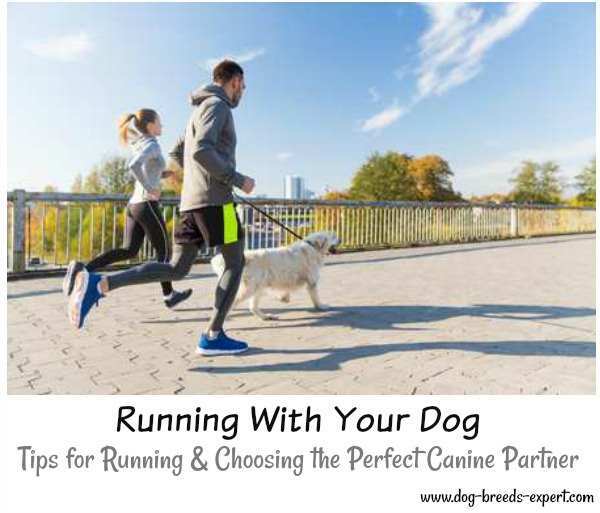 Tips include breeds most suitable for runners. 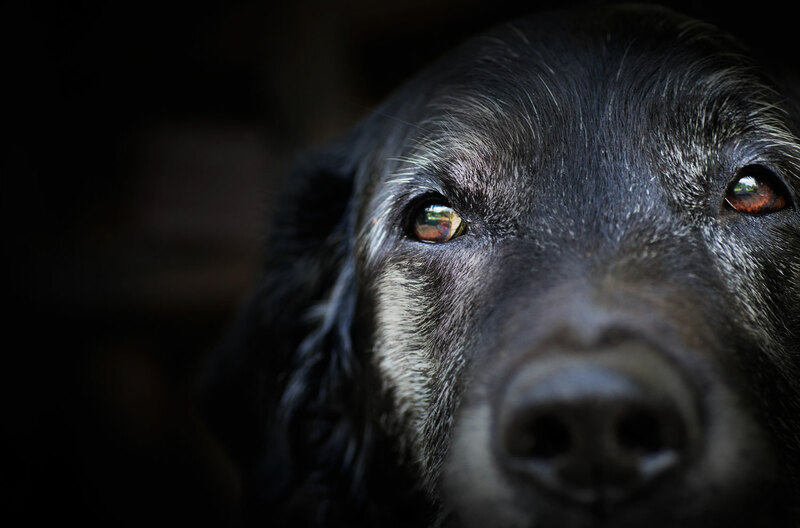 Discover the 8 BIG reasons to adopt an older dog; They are usually calm, house-trained, and welcome a new home with an open heart. By Dog Breeds Expert.